Deacon Paul was ordained to the deacon ate by His Eminence Metropolitan Antony in December of 2013 after completing three years of coursework at the St. Stephen’s House of Studies. In his final year, he chose to make ministry to the parish elderly his independent project and felt a calling to that ministry. His ministry has been fulfilling not only to himself, but also to his wife, Pani Mary Ann and his granddaughter, Marissa. He attributes his decision to follow God’s calling to the mentoring of his pastor, Fr. Anthony, and his own wife, both of whom urged him to begin his studies for the deacon ate. Retired himself after forty years working with the learning challenged, he looks forward to his wife’s future retirement. They are contemplating expanding their ministry to include hospice care and the homebound elderly. 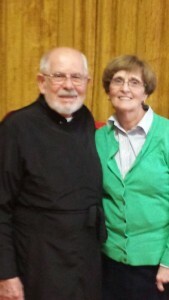 Deacon Paul and Pani Mary Ann also assist Fr. Anthony by presenting a course that emphasizes the challenges of the realities of married life that young couples will face as they contemplate and prepare for the Sacrament of Marriage.